Risk is the potential for harm. Although the concept of risk—and some of the same analytic tools—are also used in finance and actuarial science, as well as to describe threats from natural events, this discussion focuses on risks to human health and the environment from toxic pollution. emotional energy. Maintaining an appropriate balance between the level of social concern about a threat on the one hand and the extent of its social impact or risk on the other hand is an ongoing challenge for risk communicators, an engaged citizenry, and policymakers. Hazards to human health include cancers, asthma, skin rashes, infectious diseases, eye and lung irritation, developmental problems, and broken bones. Population hazards also include habitat destruction, resource degradation, threats to public health from contamination of drinking water, bacterial resistance to antibiotics, famine, and such macroconcerns as global climate change. Of greatest consequence are hazardous effects that are irreversible or long lasting, or which seriously compromise the length or quality of lives in current and future generations. Hazards that will affect future generations, or groups spatially removed from the root of the problem, may go unidentified or be discounted in formulating an assessment of risk. 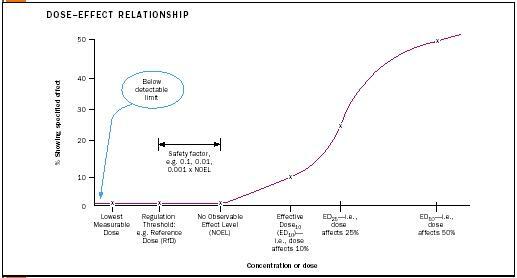 The toxicity or severity of a hazard can be described by a dose–effect (also called dose–response ) relationship. This concept is conveyed graphically by plotting dosage (amount or concentration of a toxin) against population. Data for describing dose–response relationships are gathered from tests in which groups of organisms are exposed to a toxin at a range of doses. Typically, as the dose increases, the toxic effect of concern is produced in more of the population. The dosage at which the specified effect is measured is called the effective dose (ED). The percentage of the population affected is indicated by a subscript. So for example, ED 10 refers to the dose at which 10 percent of the population would be affected by the toxin. When the measured effect is mortality, the term lethal dose (LD) or lethal concentration (LC) is used. An LD 50 is the dose at which 50 percent of a population is killed. At the same dose, chemicals that are more hazardous affect a greater proportion of the population than do chemicals that are less hazardous. Thus chemicals that are less hazardous have a higher ED 50 or LD 50 than do those that are more hazardous. While human beings are the population of ultimate interest in dose–response studies of human health hazards, rodents are typically used as surrogates in lab tests of the effects of the toxic materials. The process of extrapolating results from rodents (or other indicator organisms) to people introduces layers of uncertainty because of physiological, developmental, and size differences between the species. Hazardous effects on plants and animals are also studied using the same conceptual methods, both because of the intrinsic value of these species and also, in some cases, because they are indicators of indirect effects on the human population. As dose–response relationships show, populations are not equally susceptible to toxic hazards. Differences among individuals are due to gender, age, inherited genetic makeup, and the wear and tear and immunities that develop during the course of life. For example some people have inherited the genes that enable them to detoxify certain pesticide poisons. These people do not get sick from exposure at levels that make other people ill. Current research is linking biomarkers for genetic risk factors to disease outcomes. As it becomes clearer why people are differently vulnerable (or resistant), it also becomes more apparent that the same risk-based standards may not be applicable across populations. For example dietary iron is a risk factor for heart disease among middle-aged men at concentrations considered beneficial to women of reproductive age. Vulnerability to hazards also changes during our lifetimes, with greater sensitivity to many toxins during fetal development, the rapidly developing stages of early childhood, and puberty—although negative effects may not be manifest until much later in life. For these reasons, among others, exposures are not easily tied to disease outcomes (see sidebar). Just try to imagine, for example, how you or your parents would struggle to respond accurately to a survey asking which pesticides you were exposed to in early childhood, and in what quantities! Some toxins and infections are particularly hazardous to those with weakened immune systems and defenses, such as the elderly and those whose systems are compromised due to other diseases or by interactive effects with medical treatments or other chemical pollutants. Individuals are not at risk from the consequences of a hazard if they are not exposed to it. The critical factor linking exposure to risk is the quantity of toxin that is bioavailable to vulnerable organs or processes. However, bioavailability is difficult to measure directly, so various measurement endpoints are used as surrogates for exposure. For pesticides, these have included sales and use data, application dosages, residues on food, and fate-and-transport data (i.e., what happens to a pesticide after application, where it goes, and how fast it degrades). Exposures are sometimes estimated from mathematical or simulation models that extrapolate from data collected by empirical studies (e.g., the amount of pesticide reaching skin or clothing, tracked indoors on shoes, or leached through soil into groundwater). Estimates of exposure can vary widely, depending on the method for collecting data, the surrogate indicator used, and whether the assumed range of possible exposures is limited to permitted quantities or also includes accidental or purposeful exposures at much higher levels. Whereas risk assessments are a product of the quality and choice of input data and the assumptions incorporated into the assessment model, the usefulness and relevance of a risk characterization depend largely on how the risk problem is perceived and formulated. A well-formulated problem must engage the perspectives of multiple "publics" and be integrated with decision-management options. 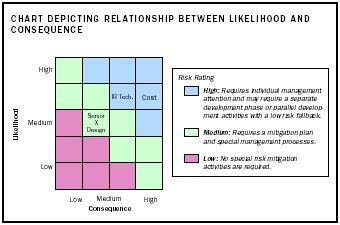 Perceived options for risk management are constrained by societal values that determine what are considered acceptable risks and by the resources invested for risk mitigation (i.e., for preventing or remediating the problem). 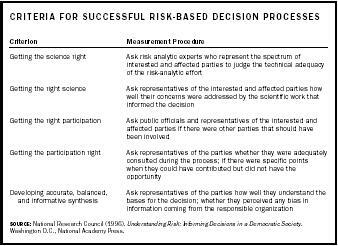 The National Research Council framework for using risk to "inform decisions in a democratic society" (1996) iteratively builds from a multifaceted formulation of the problem incorporating all aspects of risk analysis. As defined by the Society for Risk Analysis, the premier professional organization in the field, these components include risk assessment—or the quantification and description of hazards and exposure, risk characterization, risk communication, risk management, and policy relating to risk. Criteria for a successful risk-based decision process are listed in the following table. The assessment and regulation of sewage-sludge disposal provides a good illustration of the potential and foibles of risk-based decision making, underscoring the importance of a participatory and iterative analytical and deliberative process in setting risk standards and developing protective environmental policies. Sewage sludge is the semisolid or concentrated liquid residue generated during the treatment of wastewater. In addition to biodegradable organic material, sludges can contain pathogens (disease organisms) and industrial pollutants (such as heavy metals) that can be damaging to human health. Among the means for disposing of sludges—by incineration, landfilling, or spreading across farmland and other open space—only land application has the benefit of returning the fertilizing nutrients in sludge to the soil. However, land application also has associated risks, including the long-term effects of increasing the concentration of nondegradable contaminants in the soil. These elements can be taken up into food plants, ingested by children who put soiled hands into their mouths, eroded into surface waters, or leached into groundwater. The benefits and risks of sludge disposal accrue to different groups: The advantages of cheap disposal are reaped by those generating waste. The benefits from fertilizing nutrients are reaped by farmers and other land managers. Risks accrue to those who may ingest the toxins through the media of food, soil, water, or air, now and especially in the future, when toxins will have accumulated to higher levels. SOURCE: National Research Council (1996). Understanding Risk: Informing Decisions in a Democratic Society . Washington D.C., National Academy Press. concentration load (MCL) per unit quantity of sludge was derived from an assessment of how much of each element a person could be exposed to in their lifetime without causing unacceptable harm. To calculate the MCL, assumptions were made about the body size of this person and what they would eat in the course of a lifetime (and therefore how much of each pollutant would be consumed). The model person used for the calculations was a young adult male who did not eat many vegetables (the food group that accumulates the heavy metals). Some therefore argue that this risk assessment is not sufficiently protective of children and of people who eat many vegetables or would otherwise be exposed to greater contaminant levels. It is entirely possible that comparably protective standards could have emerged in the United States from a risk-based policy that was more appropriately sensitive to vulnerable subpopulations, that incorporated protective buffers to compensate for current scientific uncertainties about the hazards of these elements, and that assumed higher levels of possible exposure through food, soil, and airborne particles. The summary lesson to be taken from this comparison is that no matter what framework or assumptions are used—whether it be risk analysis or some other—decisions regarding health and the environmental protection are based on an intermixed combination of social values and science, neither of which is objective nor without uncertainty. While the view and measure of "risk" are not the same for all, the concept of "risk" remains meaningful and useful; "risk reduction" is a critical objective across all policy arenas; and the framework and tools of risk analysis offer a structured approach for evaluating, prioritizing, and acting on environmental and health issues. Harrison, E.Z. ; McBride, M.B. ; and Bouldin, D.R. (1999.) "Land Application of Sewage Sludges: An Appraisal of the US Regulations." International Journal of Environment and Pollution 11(1):1–36. National Research Council. (1996). Understanding Risk: Informing Decisions in a Democratic Society. Washington, D.C.: National Academy Press. Centers for Disease Control and Prevention. "Cancer Clusters." Available from http://www.cdc.gov/nceh/clusters . Cornell University, Environmental Risk Analysis Program. "Links to Risk Analysis Resources & Organizations." Available from http://environmentalrisk.cornell.edu/ERAP/RiskLinks.cfm . National Cancer Institute. "Cancer Clusters, Cancer Facts." Available from http://cis.nci.nih.gov/fact/3_58.htm . Society for Risk Analysis. "Risk Glossary." Available from http://www.sra.org/glossary.htm . When a number of people in a neighborhood or workplace develop the same disease within a short period of time, it may signal a disease cluster. A disease cluster is defined by having more cases of an illness within a particular geographic area and time period than would be statistically expected for a population with the same characteristics. Disease clusters can result from exposures to hazardous materials in the local environment or from similar lifestyle risk factors (i.e., people who live or work together may have similar eating, exercising, or smoking habits). Disease clusters can provide clues to the cause—or risk factors—associated with a disease. They are easier to identify when a number of people show the same symptoms soon after exposure, such as when nausea follows soon after eating spoiled food in a restaurant. With a longer lag time or small number of sick people, or with symptoms that are dissimilar or not obvious, real disease clusters may not be noticed. Conversely, clusters may be suspected due to misperception of a higher-than-average incidence of cases, or when different diseases are perceived to be the same or to have stemmed from the same cause. Cancer clusters are particularly difficult to prove because (1) there are more than one hundred types of cancer, each with different associated risk factors; (2) there is a typically long lag time between exposure to environmental risk factors and noticeable development of the cancer; and (3) the location of the suspected cluster may be different than where a diseased person lived, worked, or went to school at the time they were exposed. Cancer clusters are more likely to be identified if a large number of individuals are diagnosed with a rare cancer or one that is rare for their age group. The "X" factor is a major stumbling block in communicating risk. Health standards are expressed in terms of 1 × 10 –4 or 1 × 10 –6 . This is a shorthand way of expressing the increased number of deaths that exposure to the contaminant of concern is likely to cause over a given period of time. A 1 × 10 –4 risk is a 1 in 10,000 (4 zeroes) risk; a 1 × 10 –6 risk is a 1 in 1,000,000 risk. Since risk is dose (level of exposure) times time (length of exposure), a 30-year 1 × 10 –6 health standard for cancer risk is the level of exposure that would be expected to cause one additional case of cancer in a population of one million people exposed at that level for 30 years.